Indian National Security Adviser Ajit Doval met the U.S. defense secretary in Washington, D.C., last week. U.S. Secretary of Defense Jim Mattis met Indian National Security Adviser Ajit Doval on Friday in Washington, D.C.. 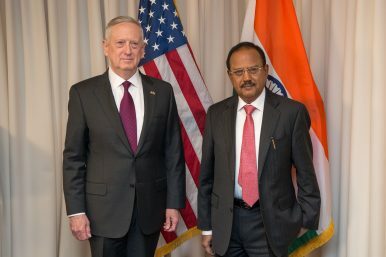 The meeting marked the first encounter between Mattis and Doval, and is the first high-level U.S.-India meeting on defense and strategic issues since former Indian Defense Minister Manohar Parrikar left office to serve the chief minister of Goa following recent state assembly elections in that state. In remarks before their meeting, Mattis noted that “Democracies like ours need this sort of dialogue and we have had a strengthening of the relationship over the last several years.” Doval acknowledged that India and the United States shared common values and a belief in democracy. He did not, however, specifically mention what would be on his agenda beyond a general furthering of U.S.-India strategic cooperation. Ahead of Doval’s visit, Indian commentators speculated that he would seek the Trump administration’s support for a stronger approach toward Pakistan. After a burgeoning attempt toward diplomatic rapprochement, Indian Prime Minister Narendra Modi’s government has seen bilateral ties with Pakistan deteriorate quickly over the last year. India blamed Pakistan for abetting cross-border infiltrators who staged attacks against Indian armed forces in Kashmir and Punjab. After the September 2016 Uri attacks, which killed 19 Indian soldiers, India claimed to have carried out a cross-border “surgical strike” against militants based in Pakistan-administered Kashmir. A Pakistani readout of a phone call between Pakistani Prime Minister Nawaz Sharif and Trump during the presidential transition period in the United States noted that the incoming U.S. president was “ready and willing to play any role that you want me to play to address and find solutions to the outstanding problems.” The Trump administration, however, has made no significant statements with regard to the situation in Kashmir. Whatever comes after India’s election, the role of China will loom large in Indian foreign policy.